Can travel in AC comfort across the country until reaching our vacation destination and set up base-camp. Can travel more miles in a day extending our overall range. Camper can be set up while still on the trailer, the head of the bed out over the tongue and the 6X6 changing room on the trailer floor (after trike is offloaded). In this configuration, the camper is up off the ground (especially nice during inclement weather). 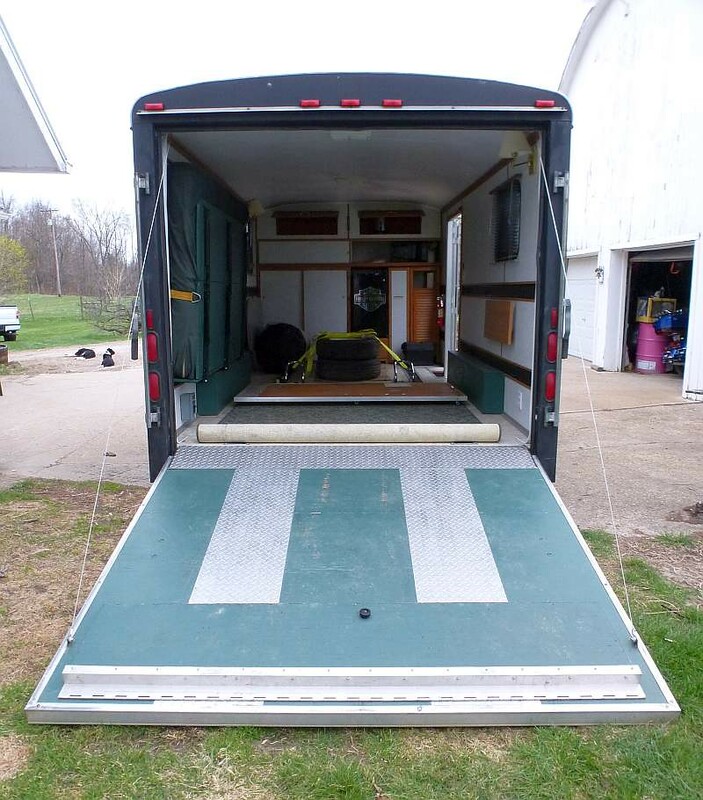 The last 6 feet of the trailer can be used as a 6X6 wooden deck, it could even be covered if we feel the need. Lots of options. Camper can be offloaded and used with the trike as normal for overnight day trips if desired. Less mileage on the trike pulling the camper (not really a concern). Consider mounting a battery box with battery on the tongue for optional power to the camper as well as power for a winch. Once the camper is set up on the trailer I can also look for other "optional" items to enhance the design. One problem I have already identified is the AC Unit access hole in the changing room. It will come out right up against the wheel well area. It would be nice if the AC unit would sit on top of the fender (12 inches from floor) but I think that's about 4 inches too high. I won't know for sure until I get the camper set up and try it. I'll post progress updates as I move along on this project! For the harness and the brake control. Etrailer should have exactly the parts you need and prices are very fair. 1 thing I will caution you about is do not make the ramp to load the Aspen onto the trailer short, as the 'basement' section of the camper will ground out due to it's low clearance. I have to watch it whenever I load my sentry into my Toy Hauler, which has a long loading ramp! Got it covered Ken, I am removing the tail gate/ramp and I'm using 3 arched aluminum ramps for the trike, I will use 2 of them for side loading the Aspen. It takes care of any bottoming out issues. This https://www.summitracing.com/parts/ptm-pp2911-s?seid=srese1&amp;cm_mmc=pla-google-_-shopping-_-srese1-_-pit-posse-motorsports&amp;gclid=EAIaIQobChMIiZ6I0v_x3AIVGsDICh3AoAPXEAQYASABEgK47vD_BwE is what I have in my cargo trailer. It does not lock the wheel but it does keep the trike from moving forward as long as I tie it down with a tie to each corner. I sometimes don't use it depending on what else may be in the trailer and the trike is fine just tied down 4 ways. These chocks are available in 16 and 24 inch lengths so they can be secured to the trailer frame. Thanks Doug, these look interesting however I already have a wheel chock and I have a friend that is making me a plate with four nuts tack welded on for mounting under the trailer. Then I can easily remove and reinstall it from the top (without crawling under trailer). It's not as convenient as your suggestion but I already have it and my budget is already pretty stretched. Great suggestion though and it may be in the cards for next season!!! I've never done the trailer brake thing. Does anyone have any guidance they would like to offer up? The trailer is all wired for the brakes with a 7-wire connector. I have ordewred the 7-wire connector kit with relays for the Nissan Xterra. Does your vehicle have a 7 wire plug on the rear? easy if it does. When you get it call me. It will be a plug and go. I can give you a couple tips. I have wire a few cars and trucks in the past. It will once I get the Nissan Xterra 7-wire kit and install it. The kit has been ordered and should be here this Sunday. That should take care of the rear. Now you will need to wire the cab. If the truck did not have the 7 wire plug on rear from factory it is probably not a trailer tow package. With trailer tow package there is a plug under dash, in the case of yours I think it should be behind a panel above and to the right of accelerator pedal. only thing I not 100% sure with non trailer tow that it will be there. you can look on you tube site for year and model for brake control install. See where they find plug harness and look at your truck. If it is not there sometimes you can order the plug in unit and relays from Nissian or it may have to be hard wired. I am here and will help you threw it. First minor glitch: I knew I would have to take 2 bolts out to remove the Aspen tongue but I didn't look close enough to realize that it only removes the straight piece and that it DID NOT remove the two curved pieces. So, I had originally thought that a 76" wide trailer (between the rails) would hold the length of the Aspen with the tongue removed. This is not the case as the length of the Aspen frame without the straight tongue piece is about 88" which is 12" longer than I had planned for. I won't be cutting any part of the Aspen frame so I will have to let it overhang a bit on each side during transit. If I do then it will still be inside of the trailer wheels/fenders as the overall outside width of my utility trailer is 98". It should be noted that the tub is not a problem (just the frame) as the tub measures at 72" X 42". I should be able to split the difference on both sides of the utility trailer without an issue. However, it will make it necessary to have two positions for the camper, one position for transit and another position for setting the camper up. Did you notch out the upper frame rails so the Aspen can be loaded cross ways? Or have you "shelved" boards across the tops of the side rails to carry the Aspen higher? Having seen the standard construction practices on those trailers I do not think you would have any problem in removing the upper rails front of the axles so you could load the Aspen and be able to center it. You are not carrying a 6,000 lb. tractor. Drill a couple of holes in the upper rails, weld some corresponding tabs on the removed pieces and bolting the upper rails back in place for when you wanted to have them in place. Wish we were closer because making things work would just be some interesting welding. If anything ever went like one thinks it will, they are in an alternate universe. I haven't done it yet but I will be taking out the front 4 feet of top rail on the right side of the trailer. This will be for loading/unloading from the side. The rail is only 12" high and the Aspen bumper will go out the left side and the tongue out the right. Should be fine, I'm not sure that I will even bother to make the top rail fit back together on the right side, I don't think I'll need it once the Aspen is loaded and strapped down. Go to Harbor Freight and buy one of those cheap electric winches and mount it on the left side. They are wireless control now and would be great for pulling the aspen up on the trailer and you could be jockeying the front with the control in your hand. You can run the big ones off a jumper pack so a little one would run off some small battery. A old motorcycle battery that was still working would power it. You would not be needing big amps as there would be no where close to the 2-3000 rated pull. Are you planning on setting the jacks on the aspen when on the trailer? Might think about using some 2X4s screwed down to form some pockets for the Aspen tires to fit/back into. Would spot it every time. BTW a winch would let the trailer down under control. No runaways like my uncles trailer did when it was parked on a hill and I bumped it slightly causing the slender piece of wood under the tongue to fall over. Was I ever in the dog house over that. Got further into the back corner of the dog house when I told them that he should have chocked the wheels and put a more substantial block under the front when parking on top of a nice sized hill. Not an Aspen trailer but the enclosed trailer I built to haul my power chair around. The floor rotted out in it and being I want to attend the Frog Follies this coming weekend I decided I needed to put a new floor over the top of the one there. The floor was between the HF trailer and the metal enclosure and was falling out of that space. So my plan was to just remove all of the screws that held the enclosure and pry it up enough to be able to slide it out and a new one in. Wrong, I ended up having to cut the 1" square tubing that framed the back door and the bracing. Well at least now I can put a new piece of treated plywood in it this time and get some fun welding. Felt good being back in the shop but got tired quickly. Danged Rat Poison. Humans can take it but it was banned from using to kill rats and mice. Other animals were getting sick eating those dead rats and mice. Yes, I plan on using the Aspen's stabilizer jacks when on the trailer at the campsite, probably not during transit though, at least in the beginning (anything is subject to change depending upon the results). I like the idea of having pockets for the Aspen wheels, good suggestion! Will sell you my 1800. It can fit in the corner now after customizing it. Xterra 7-wire kit received and installed. Took a couple of hours. The vehicle plug is just tie wrapped to hitch for now as I need to get a mounting plate for the bumper. Will be ordering the brake controller and wiring harness tonight. It's supposed to be plug & play. Harbor Freight had a sale on and I got a 2500 lb winch w/remote for $50. Also borrowed the tools so I can start cutting the side rails off tomorrow. Will need a new upright welded on at a new location. A section of the top rail and one stanchion has been removed. I changed my mind on the side for the ramps to load/unload the Aspen. I am now going to do it from the driver's side rather than the passenger's side. This will allow for a better winch hookup location on the Aspen (tongue area). In addition, the tongue (once the straight piece is removed) should fit right around the center stanchion on the passenger's side (behind the winch in the picture) and may even allow me to bolt it into place. I originally thought I would have to remove that stanchion but now I don't think so. The stanchion and the tongue piece are both 2". Will know more once I get it loaded up, remove the tongue and check for fit. I still have to decide on how I will be mounting the winch for best operation. Update: I cut the cable ties holding the Aspen's trailer lights wires to the axle (I'll probably use a removable strapping when I put them back on) and I unbolted the straight tongue piece (2 bolts) and removed it. The Aspen is almost ready to be loaded on the trailer. Good news was that the ice chest rack was only welded to the straight tongue piece and not the "A" frame. The bad news (kinda but not that bad) is that there is a small metal plate welded to the bottom of the "A" frame (see pic) that prevents the frame from going all the way by the stanchion I left in place. This may or may not be a problem but I'm thinking I could cut it out without any serious structural issues to the tongue IF I NEED TOO. Any thoughts on that??? IMHO I would leave that plate in. Take a side grinder and remove a few thousands of an inch just help dropping the tongue it before bolting. I would also recommend mounting the winch outboard of the side if only to keep your deck clear for future loads. For pulling the on just put a clevis around the back bolt and hook the winch there. Maybe just a loop of something. By hooking on the back hitch bolt that would allow you to hoist the a-frame over the side. As sometimes happens, I was subjected to a series of "cascade" errors. What this means is that one mistake led to another which led to yet again another all in an effort to make something work that was never going to work anyway!!! It was clearly a case of the "Six P's", Piss Poor Planning Prevents Proper Performance! So, I'll spare you all of the mistakes and get right to the end result. The 48" side entry was just too narrow to allow easy loading of the camper by one person so I increased it to 54" which required the removal of another stanchion. I also ended up removing the same amount from the opposite side to allow for loading/unloading from either side. A newly realized side benefit is that I can now actually pull the camper off with the trike and only use the winch for loading! It should be noted that the top rail is 2" X 3" (not 2X2). The scrap top rails were used to create new heavier stanchions on both sides where the top rail ends. My good friend Oliver came over to do the welding for me! I also decided to attach 2 X 6 boards for the wheels to ride on and they have a 2X4 attached to keep the wheels where I want them (see pics). This makes the transition from the ramps to the trailer bed much smoother and also allows for better clearance when dropping the stabilizers. I will be installing 4 eye bolts into the 2X4s to give me some good tie down points. The missing top rails will be replaced with removable top rails to keep everything secure and help reduce trailer flexing. As of right now, the plan is to leave the stabilizers UP out of the way during transit and only lower them when setting up the camper. This should allow the camper's suspension to absorb some of the road bumps. Note: the camper is not positioned at it's final location or orientation in the photos. The new brake controller and Nissan cable harness arrived yesterday afternoon (from eTrailer.com) but I will not have time to do the install and testing until this weekend. I'll post an update when I get it tested out. Update: The install was VERY easy to do, the harness plugged into a connector under the dash and a couple of self tapping screws took care of mounting the unit. 15 minute job. I still need to do the actual adjustments but that will happen this weekend (I think).